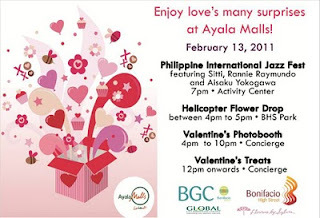 Girl Kuripot Girl Kuripot: Free Love Triangle Events at the Gardens for Advanced V-day and V-Day! Free Love Triangle Events at the Gardens for Advanced V-day and V-Day! For singles: Do you know where to hang out on Valentine's Day? For couples: Do you know where to take your date yet for Valentine's Day? I will always Y love songs regardless of my status. Here's a thought: Check out the Triangle below on February 11 or February 14, 2011. Valentine's Day Related Trivia: Do you know that there's a White Day (3/14), Black Day (4/14) and a Kiss Day (5/14) aside from Valentine's Day (2/14) in Korea? Read all about my learnings in this Guiltless Getaways post. There will be a free concert on February 11, 2011 (6 pm). Watch theater artists perform famous Broadway love songs - I want to watch this one! There will be another free concert on February 14, 2011 featuring Karylle (6 pm). Let's all celebrate the season of Happy Hearts!